Ridge's 1985 Chardonnay Monte Bello is fully mature but interesting to taste, especially from a historical perspective as it was one of the last Chardonnays to be made from the original Chardonnay vines on the property planted in 1949. Although deep in color, oxidized and past its prime, the 1985 manages to still be interesting. In many ways, the oxidative, nutty flavors are reminiscent of those found in fully mature Champagne. The 2001 Monte Bello is a total turn-on. Racy and hedonistic, especially by Ridge standards, the 2001 makes a strong opening statement with its super-ripe fruit and explosive aromatics. Beams of supporting tannin lie in the background and serve to give the wine its overall shape. Hints of leather, mint and sweet tobacco add perfume throughout. Over the last few years, the 2001 has begun to develop quite a bit of more tertiary notes. It remains one of the most flamboyant (and ripest) Monte Bello ever made. This is an especially fine bottle of the 1985 Monte Bello. Silky and ripe, but with a bit more freshness than I have seen in other recent examples, the 1985 presents an intriguing combination of ripe, voluptuous fruit gently tempered by the passage of time. Readers will have a hard time resisting the 1985, as it is arrestingly beautiful today. 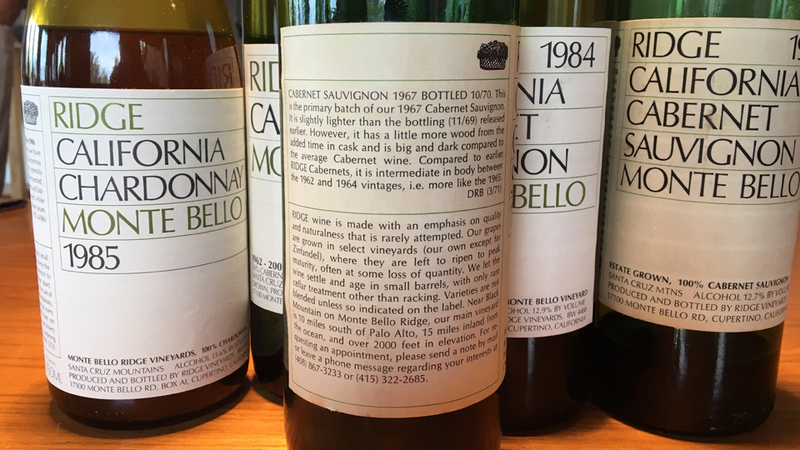 The 1984 Monte Bello is a terrific choice for drinking now and over the next decade or so, as it is close to being fully mature. Iron, smoke, tobacco, game, scorched earth and licorice, along with coarse tannins give the 1984 its somewhat burly, rustic personality. I expect the 1984 will remain at its current plateau of maturity for at least a few years, but it will always be wild, muscular and not especially polished relative to the very best years. The 1976 Monte Bello is simply extraordinary, not to mention a superb example of 1970's California Cabernet Sauvignon. Nineteen seventy six was a drought year, and that very much comes through in the wine's ripeness and overall density, even after all these years. A wine of superb aromatic intensity and striking inner sweetness, the 1976 has it all. Scents of mint, licorice, tobacco and savory herbs add nuance throughout, but as is so often the case with older Monte Bellos, the whole is far greater than the sum of its parts. What a wine! 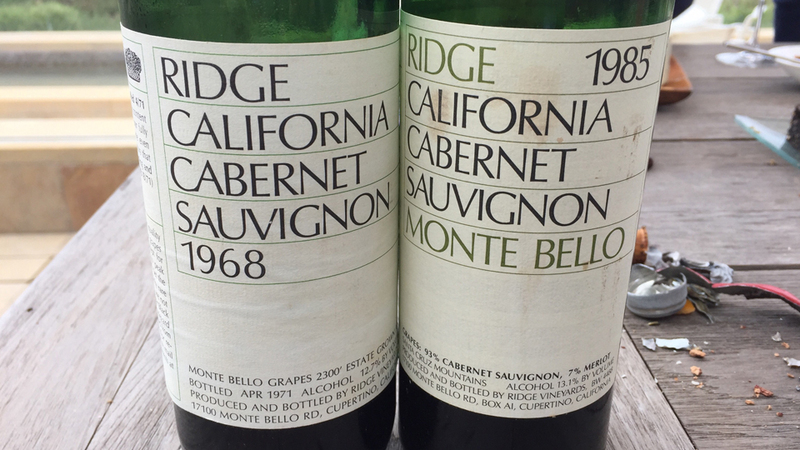 These two wines from the 1960s predate Paul Draper’s arrival in 1969 and are from the period when Monte Bello was simply called California Cabernet Sauvignon. What a pleasure it is to taste Ridge's 1968 California Cabernet Sauvignon from a pristine bottle. Sweet, layered and exceptionally pure, the 1968 is in fine form on this afternoon. The flavors are remarkably bright for a wine that is nearly fifty years old. Medium in body and seemingly ageless, the 1968 gives the impression that it will drink well for another twenty years. The 1968 was labeled California Cabernet Sauvignon, but it is the same wine that later became known as Monte Bello. I am reminded of what Paul Draper told me a few years ago. “When the 1968 released it was impossible to drink," said Draper. "Over the years the nose came around, but less so the structure. The 1968 was not pleasant to drink for at least fifteen years." The 1967 California Cabernet Sauvignon (Late Bottling) is the second batch of wine released from the 1967 vintage and spent more time in oak than the first bottling. A model of grace and understatement, the 1967 captures in full the style of wines from this Golden Era in California's history. Fully resolved, but with enough depth and freshness to drink for at least another few years, the 1967 is utterly captivating today. Scents of dried cherry, earthiness, mint, tobacco and herb are nicely lifted, but it is the wine's balance that brings me back to the glass time and again. What a treat it is to taste the 1967 from a pristine bottle. Nineteen sixty-seven is remembered as a cool year with a long growing season. At the time, the Cabernet Sauvignon was aged in neutral oak. In a word: sublime. 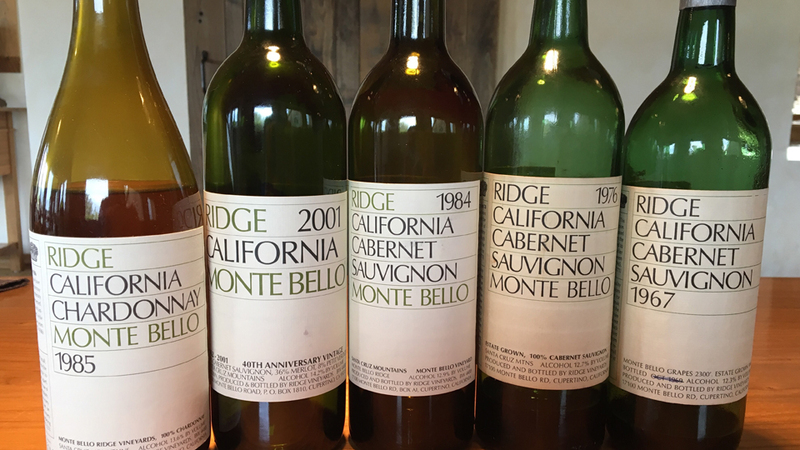 I tasted the 1985 Chardonnay, 2001, 1984, 1976 Monte Bellos and 1967 Cabernet Sauvignon with winemaker Eric Baugher during a recent visit to Ridge. About a week later, I had an opportunity to taste the 1985 Monte Bello and 1968 Cabernet Sauvignon at the home of a local collector with a deep passion for these wines.